Should A Virile Bear Be Castrated To Give Other Bears A Chance? According to some estimates, approximately 1 in 200 men living today in historical Mongolia are descendents of Genghis Khan. Likewise, one particularly virile bear living in western Europe is the father, grandfather, or great-grandfather of every other bear born in his territory for the last two decades. Pyros is a 26 year old male brown bear who likes to get around. There are four other unrelated males in his area, but none of them have ever successfully sired any offspring. Wildlife managers are concerned, because the health of the bear population in the Pyrenees, a mountain range between France and Spain, might suffer due to inbreeding. And it's a population of bears they've explicitly worked to conserve. The so-called straw that broke the camel's back was when a cub was recently born who is both daughter and granddaughter to Pyros. Officials in Spain and France have been working for more than a decade to reintroduce brown bears to the mountain range. Now the colony's survival is threatened by serious inbreeding, much of it directly linked to the continued sexual dominance of Pyros. Most brown bears are sexual active until they reach 19 years of age. But Pyros, now aged 26, shows no sign of slowing down. At a recent meeting in France, several strategies were suggested to deal with Pyros's sexual dominance. Arró is pushing for a solution to the problem before a new male bear, probably from Slovenia, is introduced to the area next spring. Two possibilities were being considered, Ignasi Rodríguez, from the Catalan regional government, told La Vanguardia. "One of them is the capture of Pyros and finding him a new home, perhaps in a sanctuary for bears," he said. The cost of this plan and, more importantly, whether tranquillising and moving Pyros would affect his health or cause possibly fatal stress, have yet to be determined. If he did survive the move, another question is how Pyros would adapt after 26 years of living in the wild. The other possibility, said Rodríguez, would be to "sterilise him and leave him in the mountains". However, there are concerns that Pyros's dominant behaviour would continue, in effect hindering the chances of other males without offering any kind of viable alternative. There's another option, of course, which is perhaps cost-prohibitive: wildlife biologists can manually collect ejaculate from the other males and artificially inseminate the females. That would have its own problems, though, because male bears are known to kill unrelated cubs. Perhaps the best option is to simply let Pyros die a natural death. 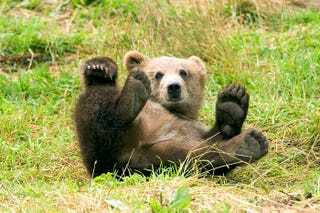 The 26 year old bear is close to the average 30 year lifespan for wild brown bears, after all. Header image: Brown bear via USFWS/Public domain.